For the past week I’ve been doing a revision to a story I recently wrote, which I’ve spent hours each day working on, so I’ve not been spending much time blogging, and it feels odd actually. In the fall, winter and spring I was always blogging and had some thought I wanted to put into the ether of the internet, but as soon as summer came I looked outside the window and have wanted to be outside in the sun ever since. Luckily I can go to Cedar’s, the cafe I blogged about previously, and sit on their patio surrounded by vines and flowers and downtown buildings and still work on my writing while soaking up the light. Which is a huge thing for me. I do much better in the summer. I think my body craves light. I’m good through the fall but usually after a month of winter I have a harder time waking up and keeping up with life and have to rely on a disciplined workout routine and diet to keep me going through the gray months. I become more introspective, which I can see from my blog posts in the winter, too. But in the summer, though I’m still a bit of an introvert always, I become much more extroverted. What sort of plant would I be? Definitely not a night-bloomer. I don’t know much about plants though. Where are the memes entitled “What Kind of Plant Are You?” when you want to actually take one? All this to say, things here are good, though there’s not much blogging happening. I’m working on that story I mentioned, getting ready to go back and finish the second half of my third novel, also building a website for a certain author which we will reveal in the near future, and planning the book launch party with my friend Brooke for One for Sorrow. Now I’m off to get more light. I wish I could store some up for winter. Just so you know, Jeff Vandermeer has a new website that looks pretty damned cool. And if you haven’t seen the Endicott Studio for Mythic Arts’s “Then and Now” website commemorating their twentieth anniversary, check it out. It has great photos of writers and artists and editors who are part of the Endicott Circle, myself included. I like seeing twenty year old pictures (or thereabouts) of people I know now. Still busy catching up with work that got away from me while in North Carolina. More soon. I am moved into a new apartment (same building, now on the second floor), which is pretty damned big and cool and well-decorated (thanks to Tony–I’m so not an interior design oriented person). Pictures of the new place in the flickr box on the sidebar. Go and admire my new office and bedroom and living room etc! This week has been really busy, trying to settle into the new place, catching up with my weekly routines, revising the story I took to Sycamore Hill, and beginning to catch up with and spend some time with friends and family before I go gallivanting to New York City for a week next month and totally lose touch with my regular reality for yet another week. I don’t teach during the summer, yet somehow life feels busier for me now more than ever. I owe lots of people email, and will be trying to catch up with those real soon. Hopefully next week won’t be as hurried and harried. I mean, come on, it’s summer! I really need to go swimming and to BBQs and picnics real soon, or it’s just not going to feel like summer to me at all. During winter I don’t like to leave my apartment unless I have to–I was born a summer child, so although I enjoy the Christmastime mood of the beginning of winter, I prefer warmth and light. So for those winter months, I write at home a lot. In Spring, Summer and Fall, though, I like to get out of my apartment as much as possible. 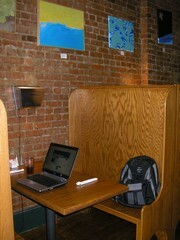 Lately I’ve been going to cafes after I work out, to write and do writing-related things. Having a wi-fi connection and a decent cup of coffee or tea, along with good scones, are my first criteria for spending hours in a cafe, so this series of good writing places in Youngstown I’m going to write about from time to time will probably be shorter rather than longer, but the places I’m going have something really special about them, so I don’t need a lot of places to choose from. Today I went to Cedars, probably the oldest cafe in the downtown. The front of the place is the cafe and restaurant, and around the street corner it sits on is an entrance to their bar, where some of the best local bands come to play every week. It’s been a favorite place of mine in Youngstown for the past thirteen years, since my freshman composition instructor invited me to come see her read poetry there when I was eighteen and she snuck me a glass of red wine to sip on through the evening. 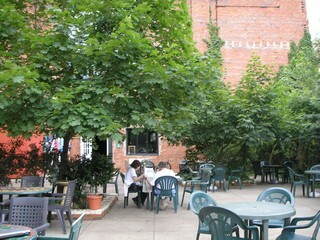 Cedars has art by local artists hung everywhere in its cafe, and a gorgeous patio as well. I tend to sit on the patio, but when it’s raining I head inside for the day and drink coffee with butter rum instead of iced tea. I totally look forward to getting up every day, knowing that after I get my exercising done, this will be one of the places I get to spend several hours in for the rest of the day. 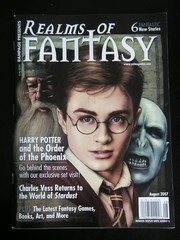 Speaking of writing, the new issue of Realms of Fantasy with my story “Little Miss Apocalypse” in it arrived the other day. The boy wizard from England is on the cover. There are lots of good stories inside. Take a looksee. **Forgot this at the time, but my story in this issue of Realms of Fantasy actually has a couple of scenes in it set at Cedars. This Saturday was Streetscape in Youngstown’s downtown. A couple of hundred volunteers from the community came out to plant flowers and to landscape the downtown together. It was a really awesome thing to be a part of, working side by side sometimes with people from your city that you know, and with people from your city that you’ve never met before. 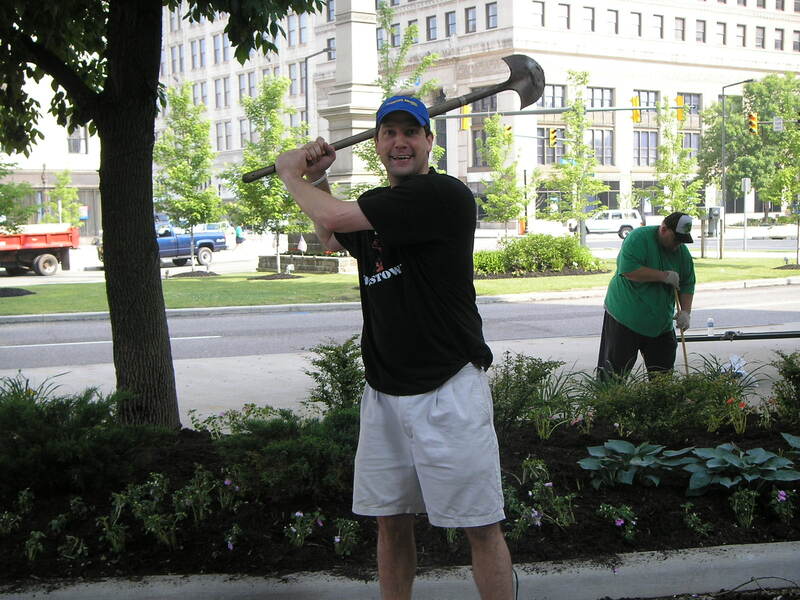 Even our congressman, Tim Ryan (below in our “Defend Youngstown” pose), came out to lend a hand. There was a spirit of togetherness all morning while we worked from 8 until noon, at which time we ate an incredible meal supplied by a lot of the local restaurants and cafes. Everything from BBQ to five different kinds of salad, cookies and brownies, Italian greens. We also received nice green Streetscape T-shirts for volunteering to work. I saw lots of people wearing them from past Streetscape events and decided maybe I should start to collect these myself. I plan to be doing the same thing this time next year too. If you’re a Youngstowner, or someone who would like to be a part of events like this in the future, take a look at the Cityscape website. Hopefully we’ll have more projects like this to complete in the near future. More pictures from the day can be found in my flickr on the sidebar, so click and go look at some photos that, for me, are truly inspiring. 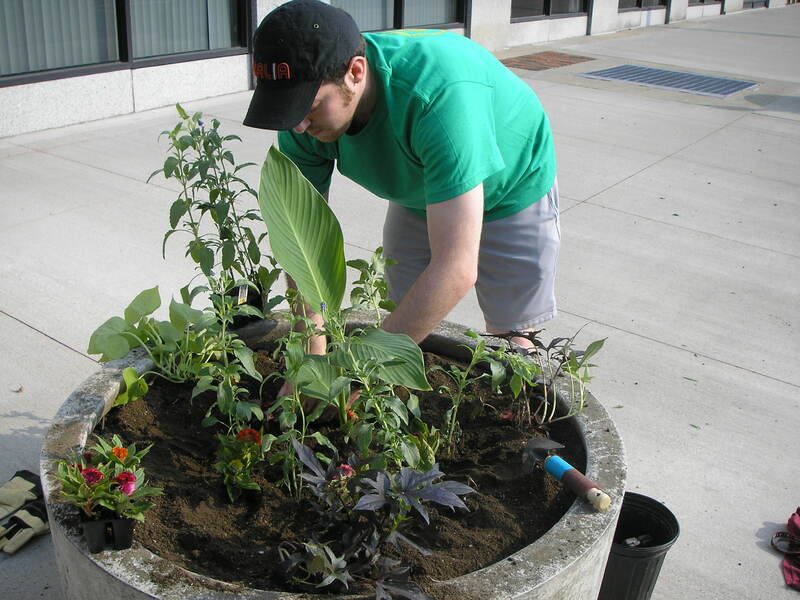 I think many of the people who volunteered on Saturday were surprised to find they weren’t the only ones who care about making Youngstown a beautiful place to live again.